Kids Go Krazy for Kernza®. 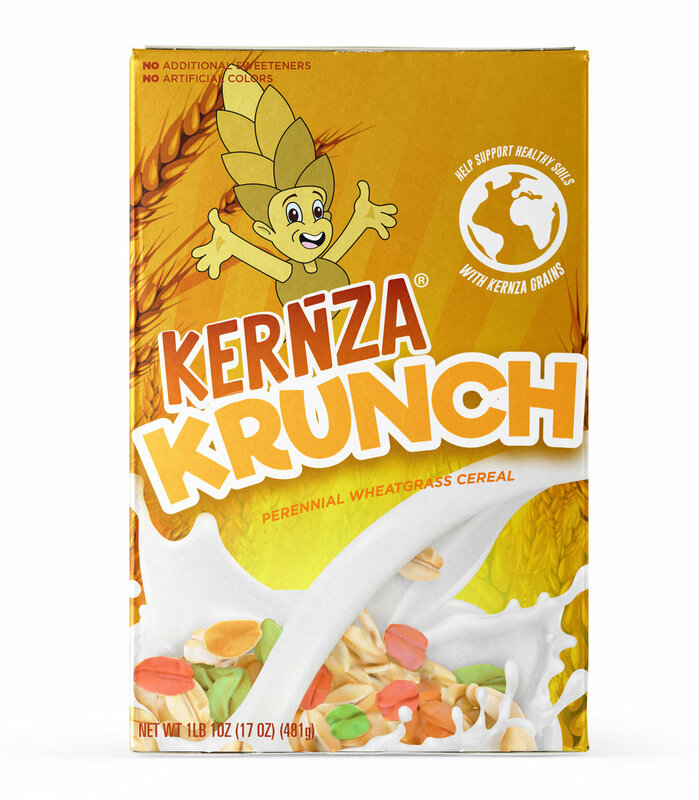 Kernza® Krunch is a deliciously sustainable and fun way to start your mornings. Fill your bowl with crispy flakes made from Kernza®, a long-rooted, perennial grain that helps preserve soil health by resisting drought and reducing erosion. Each bite is filled with a multi-colored rainbow of flakes, with a slight sweetness that comes from the natural molasses/honey-like flavor in Kernza®--no added sweeteners needed. And every flake is color coded (with natural, plant based food color) to denote where in the United States the grain came from: Pacific Northwest, Kansas, or Minnesota. See if you can taste the different regions! Kernza® Krunch is the tastiest way to support healthy soils and healthy kids. Kernza® is a perennial wheatgrass that’s been trademarked and researched by The Land Institute for decades. The Kernza® plant is a perennial that lives on for many years, as opposed to typical wheat that’s planted new each year in the fall. As a result, the roots grow up to 10 feet down into the soil which is much deeper than annual wheat. This root structure helps resist drought, limit erosion of soil, sequester carbon, and helps the plant retain nutrients. Not only is Kernza® a much more sustainable grain than most other choices, it also expresses the nuanced flavor characteristics of the soil where it was grown. Instead of a bland, uniform, lowest common denominator flavor profile, you’re getting unique, diverse flavors that each have a strong sense of their own character. You’re literally tasting the uniqueness of the land from where your food came from. Each piece of Kernza® Krunch is colored with plant-based food colors (e.g., beet juice, annatto, turmeric, red cabbage juice, etc.) to denote what part of the country that grain has come from (Green: Pacific Northwest, Red: Kansas, Yellow: Minnesota) See if you can taste the differences between each crunchy piece, from the buttery flavor of Kernza® from the Pacific Northwest to the nutty, toasty flavor of Kernza® from the Kansas plains. It’s like traveling across the country from the comfort of your breakfast table. Breakfast cereal is mass market product that has long been a staple for kids in America. By going after this mass market with a message that sustainability can be fun, we can create incredible demand that incentivizes more farmers to plant Kernza®, thereby improving the state of soil health in America today and for generations to come. Kernza® Krunch is the most fun, delicious way to save our soils. Every spoonful gives you a satisfying bite of crunchiness that starts your day off right. We’ve made it easy and fun for you to support the planet by promoting healthier soils. Kernza® Krunch was inspired by the following movements, technologies, and trends in food today. Sustainability At Scale: A concept that imagines how food companies might create products that are more sustainable as they scale, not less. Agriculture is one of the most intensive systems impacting the health of our planet. Can we take the most sustainable farming practices--crop rotation, organic agriculture, permaculture--and make these practices the rule, instead of the exception? Regenerative Agriculture: the practice of farming in order to regenerate the soil and enhance biodiversity within the farming system. The goal of regenerative agriculture is to leave the land better each year, which requires an adept knowledge of how each ecological component--water, soil, animal, plant--is interwoven into a delicately balanced system.